If you have a TIP, please call 1.800.458.TIPS (8477) or to report a crime. Are you a student in Palm Beach County and want to tell someone about information you have concerning criminal activity? Are you afraid that you will be seen as a “snitch”, a “rat”, or “squealer”? Do you want to say something about gang activity or someone with a weapon, and don’t know who to turn to? Just call the Student Crime Stoppers’ TIPS line and no one will know who you are. 2. DO NOT GIVE YOUR NAME. Say you are a Student Caller. 3. Give the information about any criminal activity at school, on school grounds, or in the community. You may be asked some questions but you will NOT be asked to give your name. 4. You will be given a code number and instructions when to call back to find out the progress on your tip. It is your responsibility to remember and protect that code number. It is your only connection to the case. 5. If the information you gave results in a success you will be given further instructions how to collect your reward. 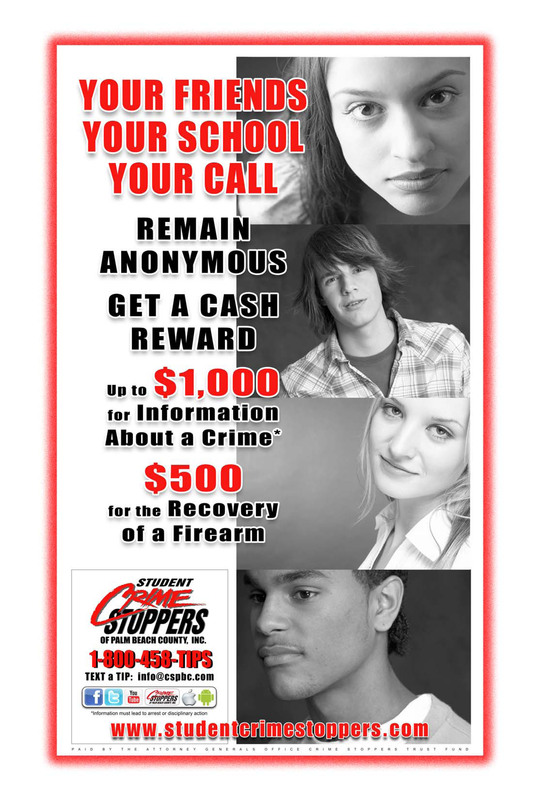 The Student Crime Stoppers TIPS line does not use Caller I.D., *69, or any other device to identify a caller. Since 1994, the Student Crime Stoppers line has received over 2,000 calls. These calls have helped your schools remain safe while not knowing whom the student caller was. REMEMBER: Do not give your name!